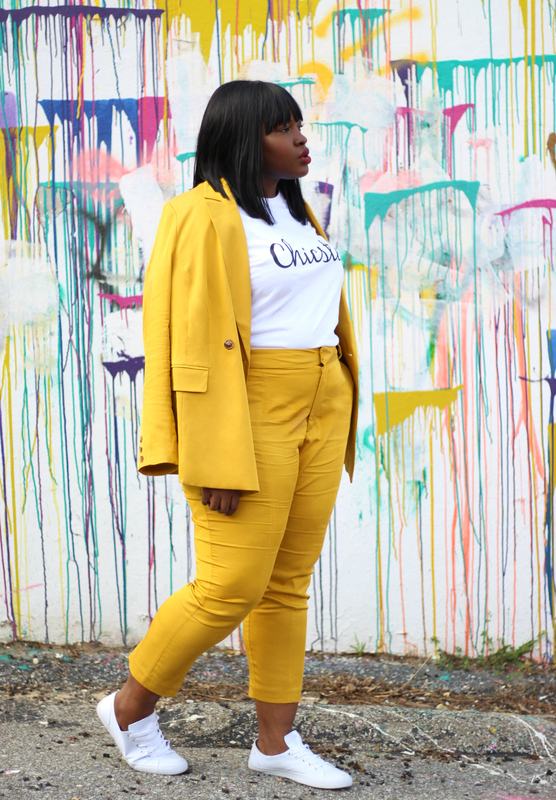 Hi, Chicsters today’s post is all about work! Workwear/style and three mistakes I made in the pursuit for livelihood. Why, one of our goals here at Supplechic is to empower women to be there best whatever they choose; from career to family to style and lately I’ve started to think about what empowerment really means. The adage that comes to mind is the one about teaching how to fish and honestly, sometimes the only way you can really empower is to be transparent about your journey it lends a real element to the lesson. If you have been reading this blog for some time or been following us on Instagram you know we love mustard. 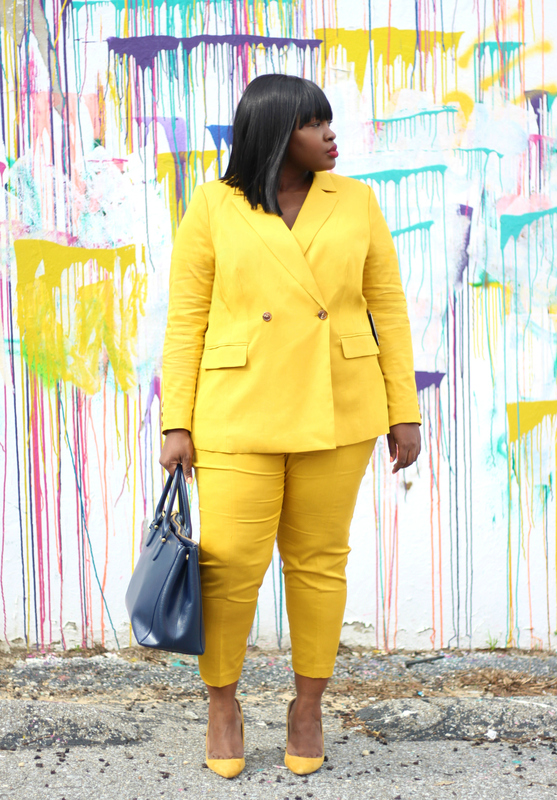 If you read our SS18 Trends Guide you would also know summer suiting is a thing ( I mean Bey & Jay in matching pastels suit) so when I saw this Mustard suit (pants) I knew it had to come home with me. Add a little flair to your summer workwear by opting for a non-traditionally colored suit! 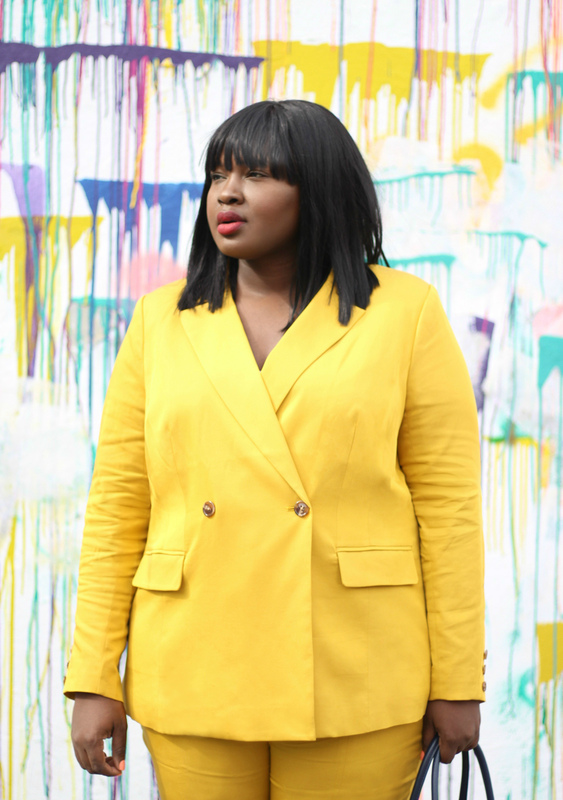 I got both jacket and bottom in a size 18 c/o Eloquii I typically size down in tops but because I have larger arms I didn’t want to take chances and I was right. Also, bear in mind that the jacket is fully lined but the pants aren’t. 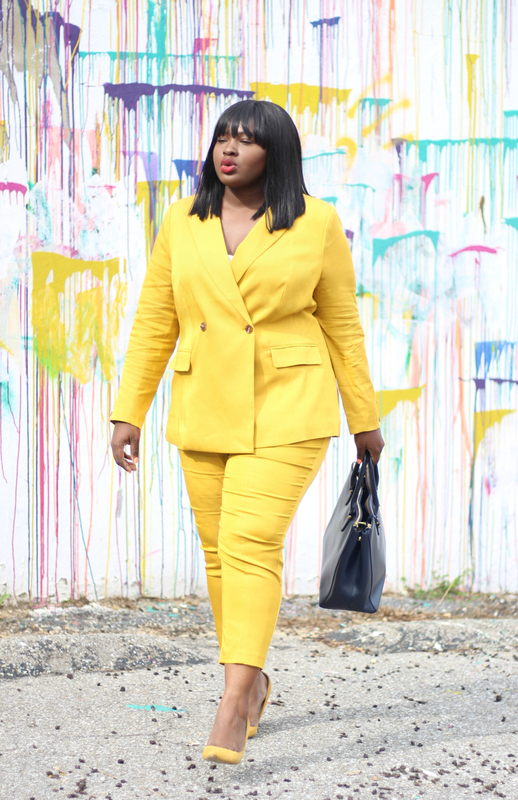 I choose to style the suit two ways but honestly, you could style this set 5 ways easily. For the first look, I went mostly monochrome with mustard pumps and a Navy tote. For the second look, I choose to go more street with a graphic tee (shop our Chicster tee Here) and sneakers. I would love to know which look is most you in the comments be below! As I said sometimes the only way you can empower is to be transparent so here we go. I was raised in a household where college was never an option by that I mean it was mandatory basically the natural order of things. My mother sacrificed to make sure I went to the best schools, she wanted me to be enlightened. However, I always got the sense that I had to have a professional job. Being a creative wasn’t an option and I know her heart was in the right place but I sincerely feel that you shouldn’t let the sacrifices your parents make guilt you into a life you don’t want. The second mistake, I graduated during the middle of the recession and I spent over a year trying to find a job. I had worked so hard to graduate between having my son, relocating I thought financial freedom would never come. When I finally got an interview I was so elated, while interviewing for one position I was asked about another and in an effort to impress my interviewers without really knowing much about this other position I said I was interested. Never ever make commitments without doing your research!!! The final mistake a rookie mistake, I did not have a clear idea of my expenses and what I needed to take home. Although my initial salary was not phenomenal it would have been enough if I was single without a dependent but it far from enough quality childcare COSTS, guys. There are a lot of people in this country that are working poor. I didn’t calculate my take home pay and was shocked, I only looked at the on-paper salary amount and thought I would be fine. I didn’t factor in childcare, a car note, student loans etc. Financial education is soo…. important! If you made it this far give yourself a pat on the back, let me continue the conversation in the comments share your mistakes as well. They say people don’t read long-form content anymore, however, I can’t help my mission. #sorrynotsorry the next post will be short and sweet promise. Have you entered our giveaway enter Here only one day left!! Finally I’m signed to the blog…really love this ..you are really doing great Chi Chi. Maybe instagram is next lol..
You look Fantastic in this suit! Yes, we all mistakes in the corporate world but we always learn from them. So chalk it up to another step on the ladder of life’s journey. Enjoy every moment. . . This jacket fits you well. I got two suits this summer that I’m gonna have to get the jackets taken in or something cause they are feeling really bulky.